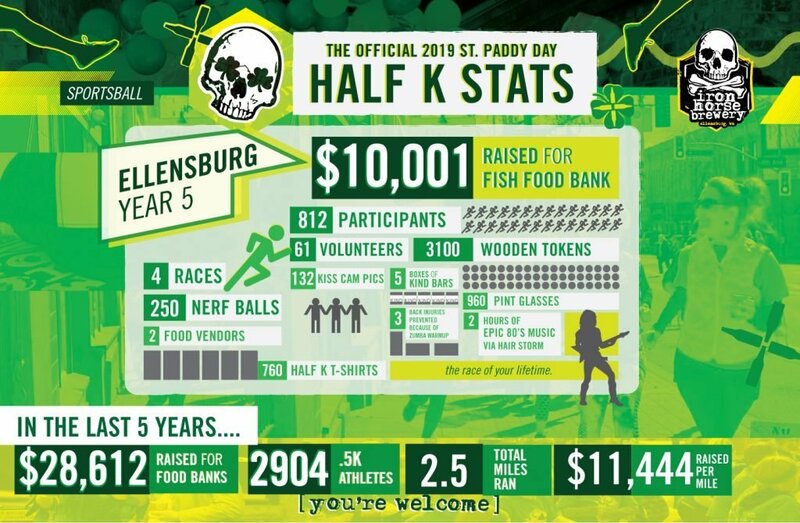 Five years ago we decided we needed another St. Paddy Day event to keep us busy during our busiest time of the year so we added the .5K race in Ellensburg. In its first year we had about 230 participants show up, and we collectively raised $2,800 for FISH Food Bank. We thought about stopping it because once you’ve done a .5K do you really need to do another? But we kept it going and you all kept showing up, bringing more and more friends, wearing more and more green. You’ve participated with your kids, your dogs, your grandmas, and this year you brought a pig. While planning the fifth St. Paddy Day .5K we knew we wanted to make a bigger impact than we had before so we aimed a little higher. Our goal this year was to raise $10,000 for FISH Food Bank, which we exceeded by $1 this year, making the grand total a palindrome – $10,001. We would not be able to do this without the generosity of local businesses, volunteers and all of the race participants. Here is a shareable infographic that shows the impact our athletes had this year and over the last five years because you probably skipped down to the picture anyway. And of course the 5th St. Paddy Day .5K would have been infinitely more boring without the help of these businesses. SHIRTWORKS did a fantastic job printing the Half-K Shirts, and helped offset the costs. We really couldn’t do this without them. Go buy some new shirts to say thanks. DAKOTA CAFE produced tasty Irish tacos that satisfied your hunger. KIND BAR gave us some healthy packaged goods that we didn’t share with you, but gave to our volunteers. ROADID provided the race BIBs so you could remember you were #71 out of 812 people. ELLENSBURG PET CENTER provided direct financial contributions to FISH Food Bank because pets love FISH too. HAPPY’S MARKET provided a direct financial contribution because they love beer and we love beer and we all love the food bank. ARMSTRONG’S STOVE & SPA donated patio heaters so you could perform at your ideal physical temperature. CORNERSTONE PIE donated patio heaters so you could warm up before and after the race. BEARDED SINNERS provided advice on beard grooming and brought sound equipment. EFFICIENT FITNESS provided gift certificates to randomly drawn participants and ran sound. Who knew running sound was a workout? BROWN & JACKSON donated two portable toilets so you didn’t have to dance around in line as long as you would’ve without them. EVOLVE CLOTHING & JEWELRY donated a bag of goodies from their store that smelled better than anything else on the race. ELLENSBURG KOA offered a discounted rate to campers doing the .5K. RED LION HOTEL offered a discounted rate to non-campers doing the .5K. MOTEL 6 offered a discounted rate to .5K participants. RHYTHMS DANCE & FITNESS helped you shimmy across the parking lot to warm up for the race. D&M COFFEE kept you caffeinated and donated profits to FISH. GRAPES & CREPES provided coupons so you could eat grapes and crepes at the same time. INDIGO YOGA taught us how to yoga and beer at the same time. CLYMER MUSEUM OF ART taught us about art and offered you a coupon. CWU set the mood for 80s rock to happen by providing a stage that could hold up with all of the stage theatrics. UMPQUA BANK allowed us to use their parking lot as a finish line. Go deposit and withdraw money from them like the winner you are. We also want to give a shoutout to all the individuals who donated directly when signing up for the race. You are neat humans and should high five yourselves. 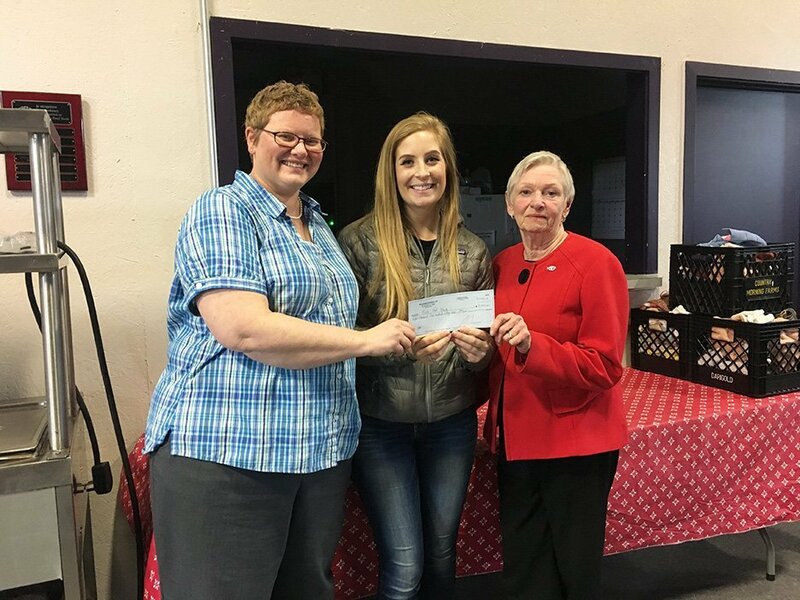 Elise Warren, left, and Peggy Morache, right, accept the $10,001 check from Aimee Bach with Iron Horse Brewery. We want your feedback. 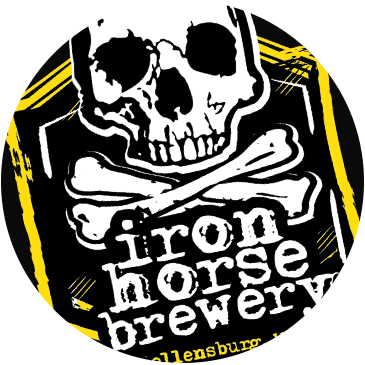 If you participated in the half k, please fill out this feedback form and you will be entered to win 2 tickets to Eastern Washington Brewfest set for May 18, 2019.